Hell Fear. These reasons not to fear Hell… may surprise you. Hell Fear. Many of you Blog-Buddies may relate to this terrible worry. Even some atheists can’t shake their fear of Hell. While others of you are simply curious. What could eliminate fear of hell lurking in the corners of your subconscious mind? Do you believe that some people might go to Hell? And might one of those people possibly be you? Even if you’re not religious anymore, might you still worry a bit? Worry that you might go to Hell. Like Hell Fear lurking at odd moments? Such a sticky kind of fear! So let’s start to un-stick it today. Especially during one session I was doing with Joe. One of my Muslim clients. Before that surprising utterance, Joe and I had done many sessions. Although not Soul Energy Awakening Hypnosis. Where Joe’s subconscious mind was in charge. Instead, sessions of RES Energy HEALING and RES Energy READING. Where Joe and I had many a conversation. Conscious minds in charge, thank you very much. Our conscious minds in charge, thank you very much! And, I assure you, the topic of Hell Fear never came up. Fortunately, I was able to help Joe move out the hidden cause of his hidden fear. (More onthat soon.) Nonetheless, I left that session newly aware of Hell Fear. How it might be troubling many clients. Not just that exceptionally good guy, Joe. And that’s what inspired today’s article. Even if your conscious mind no longer believes in a “Hell.” Or a “Satan.” Uh-oh! Many a person has unexpected patches of timid behavior. Or self-sabotage. Just because…. supposedly…. doom’s a’comin’. Blame Hell Fear on STUFF in your aura and subconscious mind. Such a good thing to blame! Since — as you may know by now — from an RES perspective, what is STUFF? Like stinky old garbage, really. STUFF (in RES) means stuck emotional and energetic garbage. Long-term stuck in a person’s aura, at the astral or psychic level. Sadly, this impacts more than energies. In addition, STUFF distorts one’s subconscious mind. Potentially leading to loads of problems and limitations in life. Even if the person consciously doesn’t suffer from Hell Fear. Not one bit. Can I prove this? No. Nonetheless, I’m very familiar with STUFF. And how much better life gets when this old garbage goes “Buh-bye.” And afterwards you receive “PUT-IN” energies that help your soul to wake up even more. Might I suggest? If you’re not familiar with the different types of STUFF on this list, investigate a bit. For instance you might click on each of these links supplied. Then be sure to scroll down to the colorful tabbed box. Relevant to this problem. So you can learn way more about underlying reasons for fear of hell. And take heart. Haven’t you been told that certain activities pretty much guarantee a permanent place in hell? Well, I’ve had clients who’ve done each of these. Plus other “sinful activities” I won’t even list here. Plus, here they are, sitting in my pink office. Ready for another session of Soul Energy Awakening Hypnosis. Because they’re human this time, right? And guess what? This time around, some of them have even moved into Enlightenment. Churches are really big into hell as a doctrine. Then there is always Dante’s Inferno. Vivid descriptions included. So, I think there is a lot ofdogma out there for people to buck in order to let go of a belief in hell! One thing of great interest, however, is that Pope Francis was recently quoted as saying there is no hell. Given that this goes against the teaching of the Catholic Church—of which he is the head—there was a lot of back peddling from the Vatican afterward which also included discrediting the journalist who conducted the interview. Fascinating, An Avid Reader. Here’s one link to the story. Meanwhile, speaking of stories, did you ever believe in Hell? What helped you to stop fearing it? And do you know anyone now who fears going to Hell (or, at least, admits it)? Does that person believe such a fear makes for being a better person or what? Hi Rose, I definitely believed in the existence of hell. i must admit that I do not know if there is a hell or not. I am not worried that I will end up there if there is a hell. I would say most Catholics believe there is a hell because it is part of the church’s teachings. I know that many Protestants believe in hell as well for the same reason. I have never heard anyone admit to being afraid to go to hell. An Avid Reader, you raise an interesting point. Just because people don’t complain to you that they’re terrified of going to hell, does that mean everybody you know doesn’t have that fear? Maybe this is one of the more personal kinds of fear. I like this article by a priest who wrote for Catholic Online. It’s interesting. I think he’s trying to comfort believers in this article. Yet if you read it again, he’s actually saying tat some people SHOULD worry about going to Hell. I was raised Catholic. And I definitely used to worry a lot about going to hell. RES sessions helped. 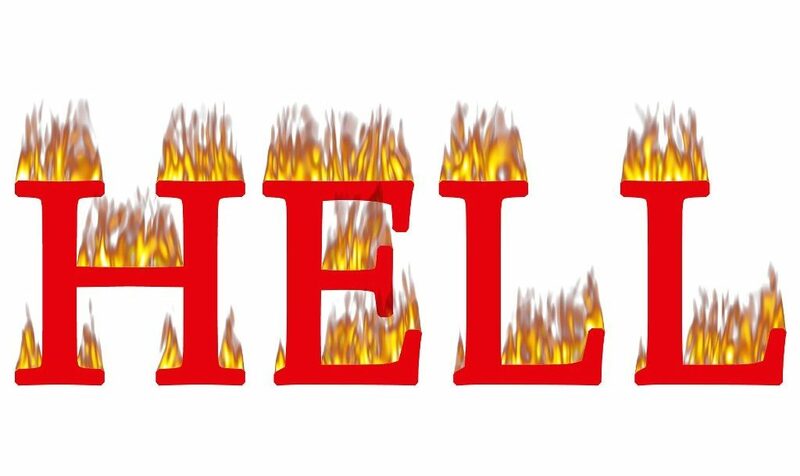 Like Rose wrote in this article, I had many kinds of STUFF that inflamed the fear of hell. No pun intended. Most dramatic to me was the session where Rose cut my cord of attachment to Jesus. Unbelievable, what was stuck in that cord. Only it must have been true because i got such good results, including a lot more peace of mind around the idea of Hell. For any of you blog buddies who have secretly been worrying about hell, like around the corners of your mind, this could make for a good session or more. I’m living proof that you really can lose your fear of hell. Growing up in Austria, I was raised with fear of hell. Every classroom in my school had a sculpture of Christ crucified. Eventually I stopped being religious. When I told my mother, she had a nervous breakdown, no kidding. Based on my experience, I think fear of hell is something people don’t talk about enough. Fear that they will go to hell and fear that people they love will go to hell, this can even be the strongest religous experience that churchgoers have. Thank you for your comment. Just to clarify: People that I know may very well have the fear of hell. Or not. I do not know. I only know that no one has discussed it with me. I most certainly did not mean to imply otherwise. Thanks to all who have been contributing at this thread. What a raw topic this can be! Yet so important to discuss. Thinking about it further, I do know that there are a number of religions that actively try to instill the fear of hell in their members. So, given that–I imagine there are a lot of people afraid of hell. I highly doubt these people are openly talking about it. You could be a very faithful member of your religious community yet drop the fear of Hell. Like all those good Italian Catholics who mostly follow their religion, true believers, and yet they use birth control. It might seem sacrilegious that I’m aiming to help you Blog-Buddies to overcome any fear of Hell you may have. Why am I going there? Because I’m an Enlightenment Coach. For at least two of the people I’ve helped move into Enlightenment, overcoming STUFF related to religious fears and guilts… This seemed quite necessary before they could move into a higher state of consciousness. With even more ability to follow the spirit of their childhood religion. Thank you for writing this blog post. Really hits home. Although my beliefs no longer consist of hell, I’m surrounded by practicing Catholics in my closest family members. The fear of hell and Satan are rampant in my midwestern town (Notre Dame is only 15min from me!) so finding likeminded people is quite difficult. I think the majority of people who believe in hell and Satan (that I know) are simply resistant to change and happy to “belong” to a large group that shares similar beliefs. I find myself still fighting the idea of hell and Satan. One reason is because there aren’t enough people around with similar beliefs. Another reason I’m so grateful for this blog/blog buddies! Such a brave set of comments, BRITTANY! * Following an authority figure like Jesus or the head of your local congregation. * And belonging to a group, a group with similar beliefs. Like the “safety in numbers” idea. Now, in The Age of Awakening, connection to the Divine is Emmanuel. God with us. Each individual can make a connection. Also each of us can learn effective skills to co-create energy HEALING, plus energy READING. Each of us. Personally. Sweet though it is to have folks nearby who believe as you do, that doesn’t have to matter so much any more. Especially since independence is required to move towards Enlightenment. Choosing those spiritual teachers and energy healers (or therapists) who really can help you, personally. Also, paying close attention to your personal results. Are they real? That matters. And it depends upon paying attention, your own self-honesty and self-authority. BRITTANY, I hope it can be freeing for you — and other Blog-Buddies — to make a very Age of Awakening distinction. Social community is grand. Is comforting. Including while you’re on your spiritual journey. But you don’t need spiritual community beyond your own connection to the Divine, plus any human teachers who can help you, plus your self-honesty and self-authority. Anything extra is like extra tinsel on your lit-up Christmas tree. Thank you, Rose! That all makes a lot of sense. After years and years of resisting going to church because I listened to MYSELF instead of “giving in” and joining the masses, it’s so nice to hear I’m not a “bad person” because of it. I LOVE this Age of Awakening distinction! Thanks so much for the “Co-Create with God for Healing” workshop this past weekend! I was in the car after and exactly this song came on!!! Maybe you Blog-Buddies will enjoy it as much as I do!!! What helped me stop fearing hell? Long story short, I gave myself permission to think of the possibility that hell doesn’t exist. And if hell doesn’t exist, then neither does the devil. And if the hell or devil don’t exist, then God must not be the kind of God that would send souls to hell to be eternally tortured by the devil. It was a process coming out of the hell-fire and brimstone preaching that I’d known all my life, and I did it before RES. Since RES, however, I’ve found a connection with God, and other Divine Beings, that is pure and sweet and 100% lacking in fear. 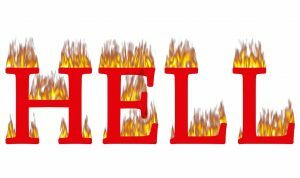 Hell is one of those concepts that I somehow never caught, in spite of definitely being exposed to it in the Catholic churches I went to. I just didn’t pay too much attention to either the concept of sinning or hell. And yet, there are other Catholic concepts that did very much influence me, and many years after I stopped being a Catholic, still informed the way I behave. One was a striving for sainthood. I remember that I loved reading stories about saints and I really wanted to be good. And goodness was associated with a super pure, non-embodied, non human, perfection. Trying to be an angel on earth! There was a passivity that went with it too, an expectation of sitting quietly and praying and renouncing worldly desires. At the amazing “Cocreate with God for Healing” workshop with Rose I went to this weekend, I realized that this Catholic overlay of belief was hindering me in gaining RES skills. Because subconsciously I still didn’t feel pure enough, good enough, special enough to cocreate with God and I expected all spiritual experience to take place in an atmosphere of stained glass windows with a special feeling of sacredness. Whereas cocreating with God is really much simpler than that, and anyone can do it. The one that talks about being a wretch who is saved by God. I didn’t know why I detested it so much–but I know now. Because it is a very Age of Faith concept, of having to be lowly and utterly debased to be lifted up by God. As Rose said, in the Age of Faith we saw ourselves as God’s children. Whereas now we are called to be God’s grownups. No groveling required! We are worthy to cocreate with God. KYLIE, thank you for all of your inspired comments today. Helping to make my day for sure. This may be uninspiring but I write it in case someone else relates. I definitely grew up believing in hell, Satan, etc and that by its own definition, hell was a place worst than anything on Earth. Believing this actually helped me to not kill myself. When I was getting out the “fear of going to hell” in a session of Soul Energy Awakening Hypnosis, I actually felt a bit panic…because there was nothing (no fear) to stop me from killing myself. The two types of beliefs were somehow connected. Of course the next SEAH session had to do with the want to kill myself. I think it important to note that fear of hell has probably held an important roll in preventing bad behavior to self or society. Doesn’t mean the person can’t do with new beliefs but I found it an important type of life lesson and somewhat confusing emotionally to sort out. Rose – I like what you wrote about having to ask yourself “Where is my allegiance, to the path I’ve been on… or to God?”. Your story reminded me of my own crossroad of decisions that I had to try something that I was taught was anti-God or devil worship (RES) in order to find healing. But thank God I made the choice to trust you and have since made a much better relationship with God as well as the healing I so desperately needed. Thank you for always!